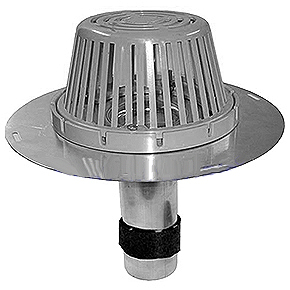 Aluminum reroof drain insert with cast clamping ring, cast aluminum dome strainer and self expanding seal. Retrofits existing drains without removing them. OPTIONS: Available in 2, 3, 4, 5 and 6 inch drain sizes, and with aluminum or plastic domes. 3 in. ALUMINUM FAST FLOW RETROFIT/REROOF DRAIN SET FOR SINGLE PLY. 10 in. CAST IRON DOME, METAL CLAMPING RING, 12 in. STEM x 16-1/2 in. SPUN ALUMINUM BASE AND EXPANDING SEAL. PRICE/SET.